Over the past decades family formation behaviour has diversified in Europe. The graph below, based on the Generations and Gender Survey, displays the percentage of men and women who have followed a traditional pathway in their family formation, that is, they experienced the following sequence of events: they first left the parental home, then married, after which they had their first child, and they experienced all three events before the age of 30. The results show a large decrease across cohorts in the percentage following such a traditional pathway. 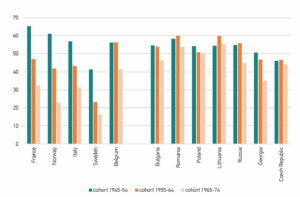 For example, in France more than 60% of people born between 1945 and 1954 followed a traditional family pathway, while this figure was down to 30% for people born between 1965 and 1974. 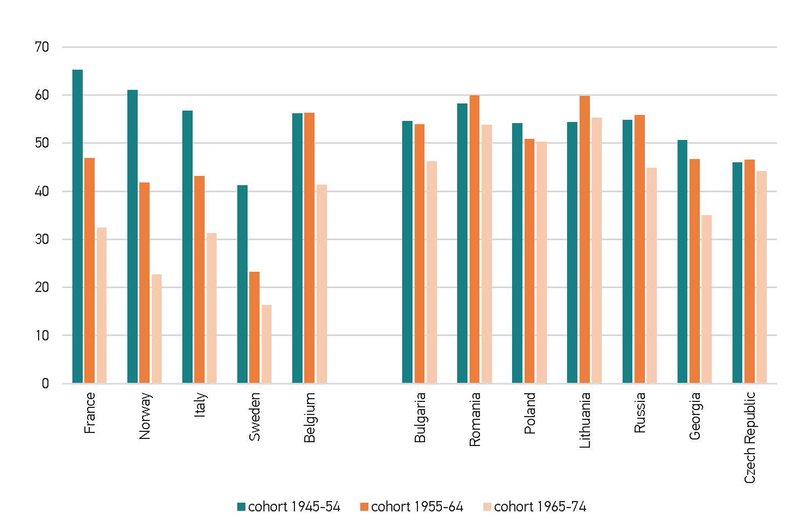 The changes in family formation behaviour are more pronounced in West-European countries than in Central- and East-European countries.